As the saying goes ‘that’s motorsport’ and Subaru of New Zealand Brand Ambassador Ben Hunt has taken last month’s crash on the chin (or ribs in his case) and is now focused on getting back on the horse at next weekend’s Rally of Canterbury. Idioms aside, Hunt is thankful his co-driver Tony Rawstorn was unhurt and the damage to himself and his Subaru WRX Sti was minimal after it rolled into a ditch at the International Rally of Whangarei. “Growing up riding motocross bikes, I got used to falling off and getting back up again. The Subaru gave us a lot more protection than I ever had on two wheels, and because it is a standard production car it has the added bonus of a five-star safety rating, that combined with a quality roll cage crafted by Paul Hayton, our Subaru provides us the confidence to get right back on the road to defending our title.” Hunt says. While his fractured ribs have been healing, the STi has been undergoing its own restorative process. Mills Collision Repair Centre in Hamilton returned the body back to factory condition by replacing damaged parts with new genuine Subaru items while The Body Shop in Auckland have made the paint job look fantastic again. “My Hunt Motorsport team have also done some more development work on the STi’s engine, so it should be running better than ever next Sunday,” Hunt says. 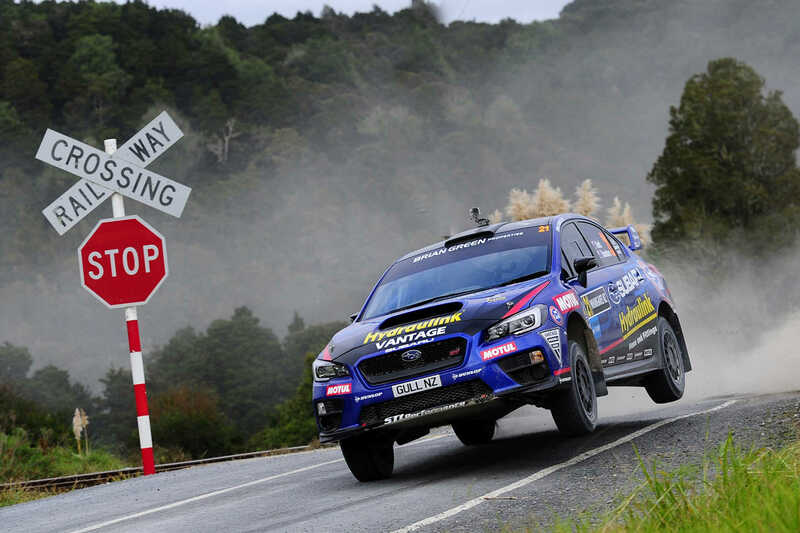 Subaru of New Zealand’s Managing Director Wallis Dumper is looking forward to seeing the Subaru WRX STi – that the company provided Hunt with, after his 2015 national championship title win– back in action. “We have every confidence in Ben and Tony’s ability to move on and continue to achieve top results, like their first outing at Rally of Otago, where they were second on the STi’s debut event. Hey, it’s motorsport and accidents are all part of it – the rollercoaster of rally fortune will hopefully tip back in Ben’s favour at Canterbury. We are pleased and pleasantly surprised about how well the basically standard production WRX is going up against all the AP4 specials that are competing now” Mr. Dumper says. Hunt has had plenty of experience driving on tree-lined roads after working as a heavy diesel mechanic in Nelson’s forestry industry for seven years. “We really need to finish the next three rallies high up the field, so we will be pushing for fast, consistent results, while also continuing the Subaru’s development,” Hunt says. He is currently fourth in the points’ standings but with Hayden Paddon not contesting any further NZRC rounds due to his WRC commitments, defending his 2015 title is still a reality for Hunt.